While you may or may not recognize Jack Pierce by name, you are most certainly familiar with his enduring legacy. 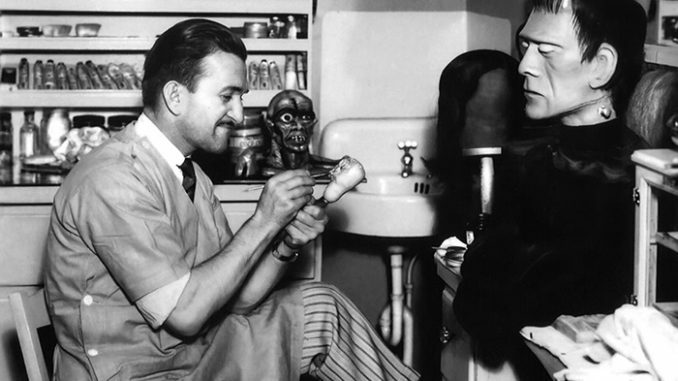 As the head of Universal Studio’s make-up department for almost twenty years, Pierce is responsible for the innovative and iconic looks of Frankenstein, the Mummy, the Wolf Man, and countless others. With his trademark surgeon’s smock and slicked back hair, Jack Pierce changed the way we think about movie make-up and inspired generations of artists to push the boundaries and never stop experimenting. Born in Greece in 1889, Pierce made his way to Hollywood in the 1920s and took on a series of roles for various studios including time spent as a stuntman, actor and even an assistant director. It was on the 1927 film The Monkey Talks where Pierce first tried his hand at make-up effects. The realistic chimp disguise he designed for actor Jacques Lerner caught the eye of Universal head Carl Laemmle and opened the door for twenty years of collaboration and renown for both the artist and the studio. 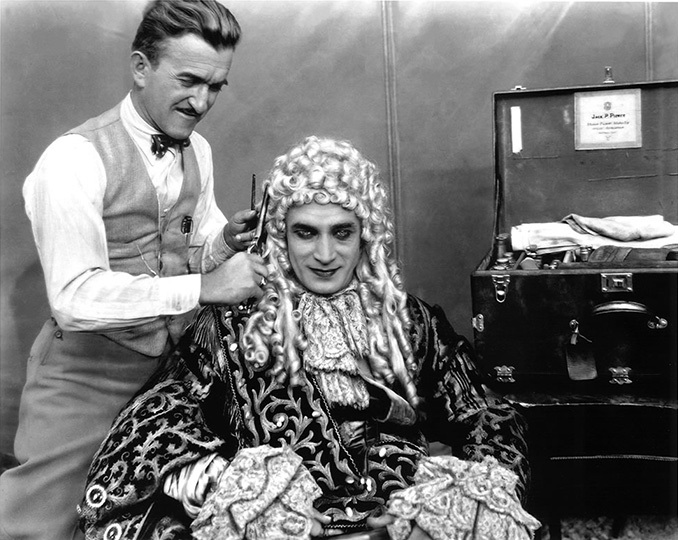 Pierce’s first job with Universal was working on the silent melodrama, The Man Who Laughs. The exaggerated smile that he created for actor Conrad Veidt was so unsettling, that it led many to categorize the film as horror. The look quickly became iconic and even inspired the design of Batman’s arch nemesis, The Joker. Following the death of celebrated actor and make-up artist Lon Chaney in 1930, a niche was opened for Pierce to fill. For 1931’s Dracula, Pierce designed a special color greasepaint for lead actor Bela Lugosi. 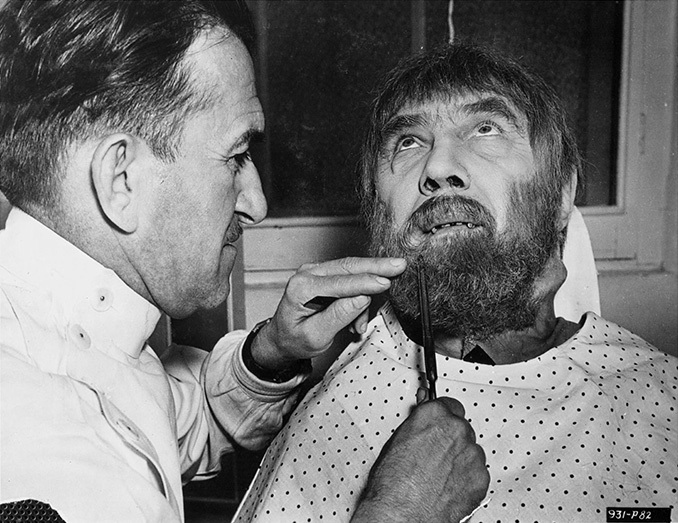 However with a background in theater, Lugosi insisted on applying his own make-up for the film. The two would still go on to collaborate in the future, most notably on the independently-produced White Zombie in 1932 and on the creation of Ygor for 1939’s Son of Frankenstein. After having his input on the look of Dracula rejected, Pierce re-imagined the Count in all future appearances with graying hair and a mustache. Known for his “out-of-the-kit” techniques, Pierce became infamous for his time consuming, often grueling, method of trial and error. Reluctant to use latex applications, his incredible results were achieved by slowly building facial features with layer after layer of cotton sealed and hardened with collodion, a type of liquid plastic. An overall unpleasant process, it was in the patience and dedication of Boris Karloff that Pierce found a perfect collaborator. 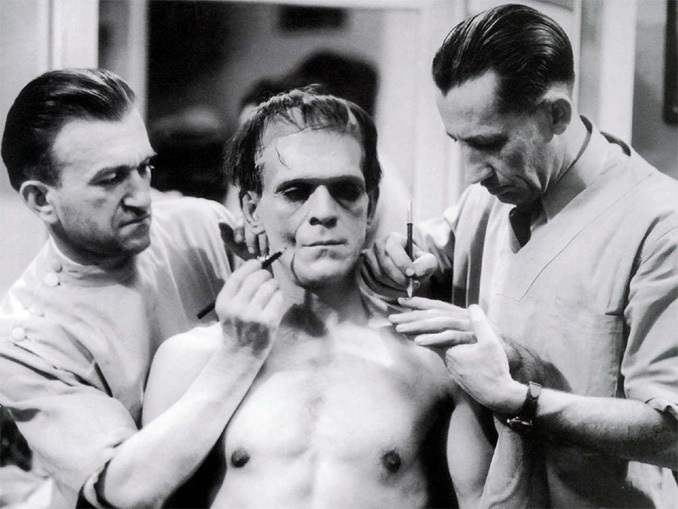 In preparation for his role in Frankenstein, Karloff had a dental plate removed and endured four hours in the make-up chair each day while cotton, collodion, gum, and greasepaint were applied to his face and hands. 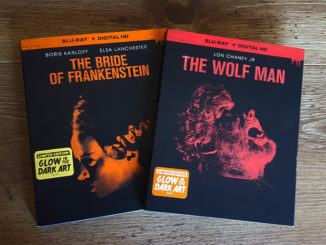 The result however was universally acclaimed and has since become the cultural standard when visually representing Frankenstein’s Monster. As unpleasant as they were to have applied, Pierce’s applications were also known for their painful removal processes. While playing Kharis is The Mummy’s Hand, actor Tom Tyler commented that the removal of cotton and spirit gum “hurt like the devil”. Pierce eventually began to embrace latex appliances, most notably a rubber head piece for Karloff in Bride of Frankenstein and Son of Frankenstein as well as a rubber nose for Lon Chaney, Jr’s Wolf Man. 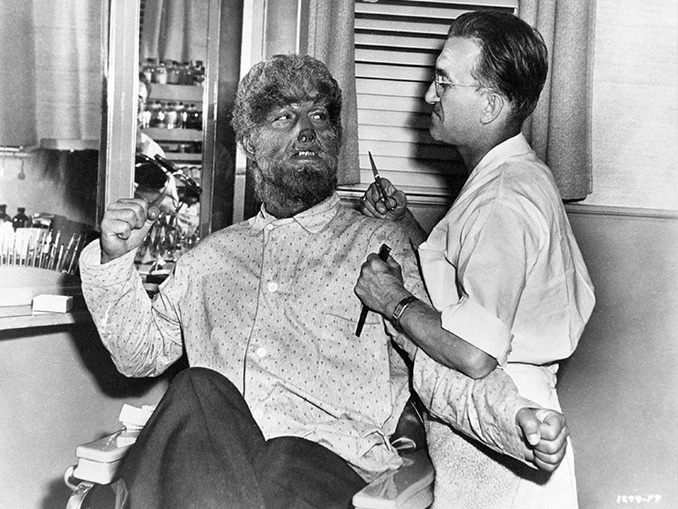 Unfortunately, the rest of the now iconic Wolf Man make-up was not as painless and led to a strained relationship between Pierce and Chaney. To achieve the proper look, individual tufts of yak hair were glued to his face and singed with a hot iron. Chaney later claimed that Pierce would burn him on purpose and once mentioned that, “He leaves some of the skin on my face”. Despite the well-publicized hostility, Chaney later called Pierce a make-up genius second only to his own father. Lon Chaney, Jr. and Jack Pierce prepare to work out some creative differences. The final original make-up that Pierce completed for Universal was Claude Rains’ Phantom of the Opera in 1943. 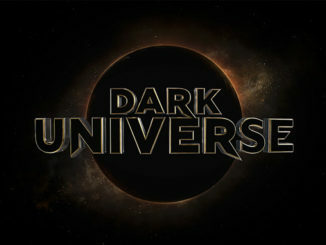 In 1947, after twenty years of service, Jack Pierce was fired from Universal after a merger with International Pictures led to the replacement of several department heads. He continued to freelance until his death in 1968. 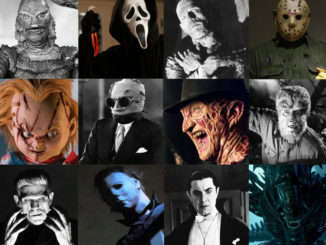 With 167 make-up credits to his name, Jack Pierce’s legacy is much larger than the handful of examples mentioned above. A cited influence of legendary make-up artists like Rick Baker and Tom Savini, Pierce was recognized with a lifetime achievement award from the Hollywood Make-up Artist and Hair Stylist Guild in 2003.